UofL has been making major headway in sustainability efforts campus-wide. UofL was the first school in Kentucky to achieve a Gold rating according the the Sustainability Tracking, Assessment & Rating System (STARS), and we continue to have the highest STARS rating in Kentucky. More than a quarter of the food on campus is locally-sourced, we host Farmers' Markets each year on Belknap and HSC, and you can grow your own food right here on campus in UofL's organic gardens. In 2016 students even tapped our maple trees to make syrup! 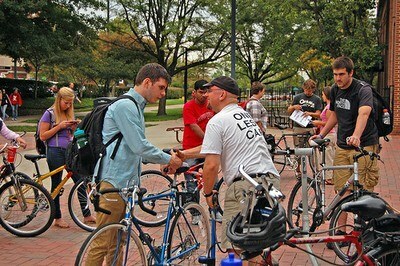 UofL has also been recognized nationally for its Earn-A-Bike Program. UofL’s Sustainability Council accepts applications every summer from those willing to not drive to campus and to give up the right to a parking permit for at least two years in exchange for a $400 voucher to area bike shops! Applications for the Earn-A-Bike program are now being accepted, and the deadline to apply is August 10. UofL was ranked the most bicycle-friendly campus in Kentucky, and one of the nine best college for cycling by Bicycling Magazine. There's never been a better time to save money and the environment while biking around campus. Apply for the Earn-A-Bike Program today!